Yesterday and today I managed to get in a little studio time. 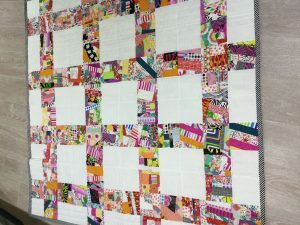 This is one of my plus quilts and it involves improv making fabric technique. 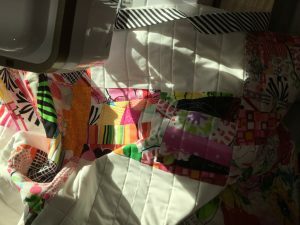 I finished the channel quilting and put the black and white binding on. Now for the handwork. 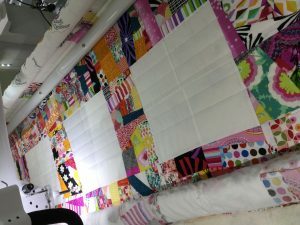 Even though I have been doing some binding handwork every night it just seems to keep growing! And I got this improv Valentine quilt loaded. I will have to think a bit about how I am going to quilt it. Merry Christmas to all. I am one of those that takes Christmas decorations down the day after the holiday so no sewing for me tomorrow! 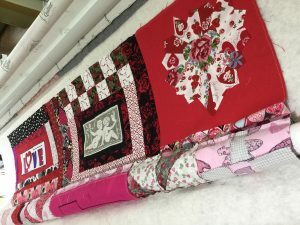 I love this sweet crosses quilt especially with the channel quilting. I am envious and ready for a project. With lots of fabric I need to make a bright red Kaffe quilt. After the New Year’s weekend, hopefully I’ll have some time.